Dumfries beat Kelso by 36 runs in the final of the Murgitroyd Borders Twenty20 Cup at Nunholm on Sunday at Nunholm to secure a place in the Scottish finals day in Glasgow this Sunday. There they will play Clydesdale in the semi-final of Scottish Twenty20 competition. Dumfries batted first and set an imposing total of 173 for 3, with opener, and the Cairndale Hotel Man of the Match, Alan Davidson showing the way with a fine innings of 83 not out. Ben Grindell provided Kelso with a good start taking two wickets caught in his second over. However, in intermittent rain, Chris Brockwell and Davidson took the score past a hundred, and at a healthy rate, when a communication failure saw an unfortunate Brockwell run out for 38. Scott Beveridge and Davidson then managed to add seventy runs in the last seven overs with Davidson hitting eleven fours and one six in his innings and Beveridge batting aggressively for 39 not out. Kelso began well until Druce comprehensively bowled Wilson for 20. Keeper Davie Davidson gave Chris Brockwell a stumping, and Gei Singh took a good catch on the boundary, off Robert McBride, to remove the dangerous Tom Grindell for the top score of 36. At that point Kelso were 81 for 3 with seven overs to go and the pressure of runs told with McBride and Drew Dawson finishing with two wickets as Kelso closed on 139 for 7. 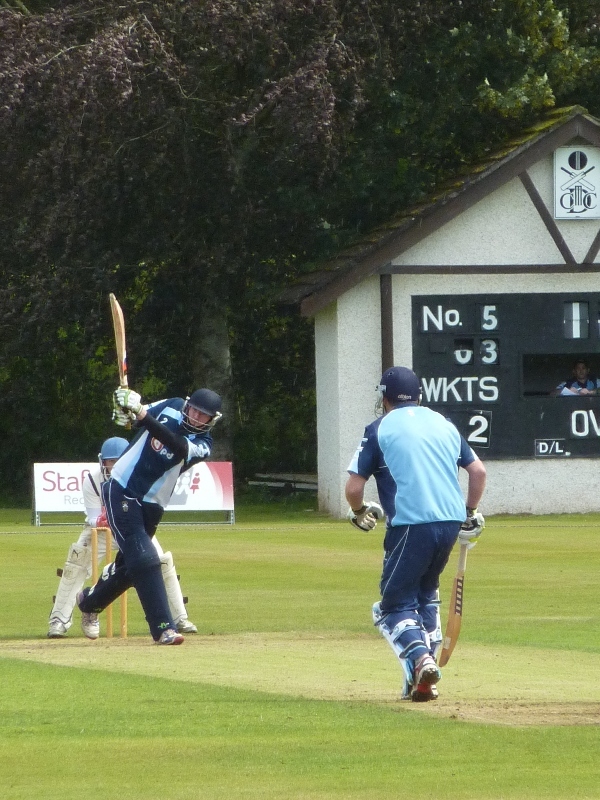 That match was followed by a well contested match between the Dumfries Sunday XI and Annan. Annan scored 141 for 5 with Kevin Bellis top scoring with 50 retired injured, and Mark Pagan backing him up with 38. Junior Matthew Currie bowled well to claim his two wickets. The Nunholm side managed to chase that down as the batsmen successfully supported a match winning innings of 71 not out from Niall Alexander. Fraser Strachan hit a run a ball score of 28. Then, from 80 for 5, Alexander and Matthew Currie shared an unbeaten 65 run partnership for the win and a share of the Star Refrigeration Man of the Match award. This Saturday, after a pause for the Commonwealth Games, league fixtures resume with Dumfries playing Clydesdale at home in the Western Premier and Nunholm are at Titwood in the Reserve League. Also this weekend, Dumfries Women’s team player Kirsty Strachan travels with the Scotland Women’s Development side to play in Guernsey.